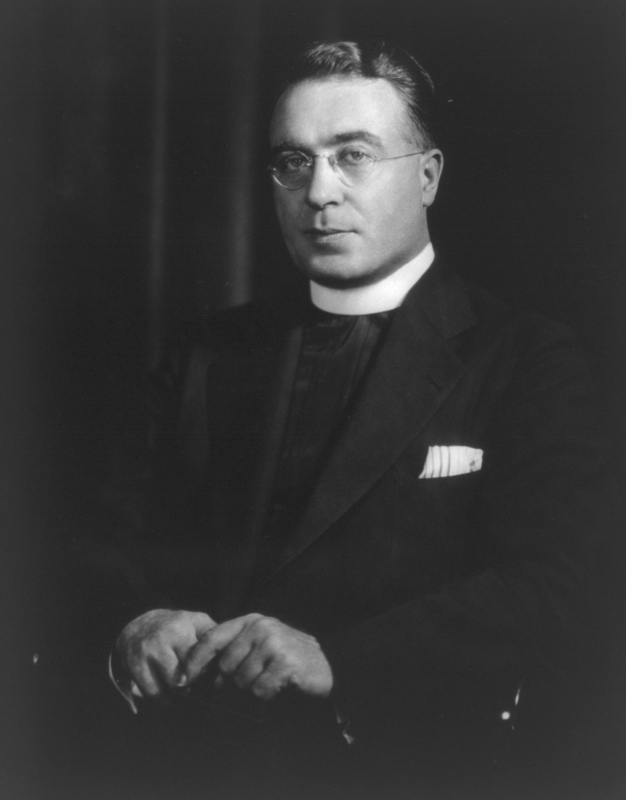 Father Charles Coughlin, was a Canadian-born Catholic priest assigned to a parish in Michigan. Coughlin was antisemitic, anti-Communist, and isolationist. Throughout the 1930s, he was one of the most influential men in the United States. A new post office was constructed in his Michigan town just to process the letters that he received each week—80,000 on average. The audience of his weekly radio broadcasts was in the tens of millions, and his journal Social Justice eventually reached one million subscribers. By the mid-1930s, Coughlin had become a vocal critic of the Roosevelt administration, and he attacked Jews explicitly in his broadcasts. In the days and weeks after Kristallnacht, Coughlin defended the state-sponsored violence of the Nazi regime, arguing that Kristallnacht was justified as retaliation for Jewish persecution of Christians. He explained to his listeners on November 20, 1938, that the “communistic government of Russia,” “the Lenins and Trotskys,…atheistic Jews and Gentiles” had murdered more than 20 million Christians and had stolen “40 billion [dollars]…of Christian property.” Following this broadcast, several radio stations refused to broadcast his program without pre-approved scripts. A few stations in New York cancelled his programs. By the late 1930s, Coughlin began to promote fascist dictatorship and authoritarian government as the only cure to the ills of democracy and capitalism. The Roosevelt administration decided that, because the radio spectrum was a "limited national resource" and regulated as a publicly owned commons, broadcasting was not afforded full protections under the First Amendment. In October 1939, the Code Committee of the National Association of Broadcasters (NAB) enacted new limitations on the sale of radio time to 'spokesmen of controversial public issues.' Manuscripts now had to be submitted in advance, and radio stations were threatened with the loss of licenses if they failed to comply. As a result, on September 23, 1940, Coughlin announced in Social Justice that he had been forced from the air. November 21 - 28, 1938 News articles about Father Coughlin’s response to Kristallnacht. November 21, 1938 - December 31, 1938 News, editorials, op-eds, letters to the editor, and cartoons reacting to Father Coughlin’s response to Kristallnacht. October - November 1939 News, editorials, op-eds, letters to the editor, and cartoons responding to the Code Committee of the National Association of Broadcasters (NAB) rules limiting the sale of radio time to 'spokesmen of controversial public issues'. Warren, Donald. Radio Priest: Charles Coughlin the Father of Hate Radio. New York: The Free Press, 1996. Marcus, Sheldon. Father Coughlin: The Tumultuous Life of the Priest of the Little Flower. Boston: Little, Brown and Company, 1973. Coughlin, Charles. The Fine Art of Propaganda: A Study of Father Coughlin's Speeches. Edited by Alfred McClung Lee and Elizabeth Briant Lee. New York: Harcourt Brace and Company, c1939.